I have been an artist all of my life, and discovered the medium of collage by accident. "What if ...'' I thought, "... I created a portrait composed of scraps of paper? Torn and cut pieces with words and images..." I began immediately, and did not look back. Bits of paper provide hue and shape, the embedded words and images imbue the picture with humor, meaning, and irony. ​Sometimes I spend days searching through my cache of paper for a precise word, in the right size and the correct color. Welcome to my web site! Search these pages and you will find portraits, still life, astronomical scenes, and landscapes. Poetry has always played a lively part in my artwork. I have incorporated my own poetry and sometimes the prose or poetry of others, like James Joyce and Abraham Lincoln. The words are hidden, and you have to seek them in the collages. My Autumnal Haiku series, depicts scenes of the season in northern New Mexico with an embedded original haiku. My favorite explorations, however, are the ambiguous borders between being and nothingness. I consider the dissolution of matter...the things that are there and aren't anymore, or things that are really, truly existent, but are so diffused, they are barely perceptible. Perhaps that is why distant galaxies hold such fascination for me. Currently, I am working on an abstract series called The Coral Reef, and each of the collages in this series of twelve engages the viewer in the flow and mystery of the seen and unseen in the disappearing reefs. This website gives you a glimpse of the artwork I have created for the past twenty-five years. Take a look, and then look closer. I grew up in Chicago and now reside in Santa Fe, New Mexico, where I have established my new gallery. 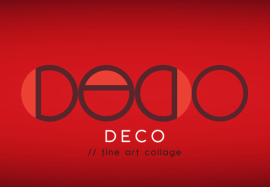 One of the most frequent questions I am asked does not concern Art - some people are concerned about my name: Deco. Where did that come from? To me it is very simple, because I have been called Deco as long as I can remember. "Deco" is a family nickname - after all, my given name "Bernadette" is quite a mouthful for a toddler. Everyone called me Deco except for the teachers in school; in fact, when I arrived at school or my first day of kindergarten, I did not know who "Bernadette" was! But by now, I know who I am, and I invite you to make acquaintance. Please send me a message if you have any questions and if you would like to purchase a piece, or visit the studio in Santa Fe.